The arrival of the US air force (the largest air force in the world) in Britain had a profound effect on the military and social history of World War II. 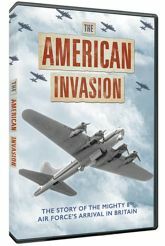 Presented by renowned actor Michael Brandon, this revealing documentary provides a powerful record of a momentous period in American and British history. The memories and experiences of the local population and surviving US airmen provide the key to understanding the courage of the men who were plucked from home and plunged into the terror of combat in the air.